A young D.C. startup on the heels of a win at the South by Southwest conference in Austin, Texas, wants to capitalize on that traction. District-based TwentyTables Inc., whose mobile and web platform gives people access to low-cost meals from local restaurants, is now looking to move beyond Greater Washington. That starts with a mid-six-figures friends and family extender round, “because of all the attention we’re getting out of South by Southwest, we don’t want to just jump at the first opportunities that come, because more than one is materializing,” said TwentyTables founder and CEO Alex Cohen. That funding would solidify the company’s operations in the D.C. area, Cohen said. It’s a precursor to a Series A round — between $3 million and $5 million — which, he said, would enable the business to start tapping into new expansion markets. TwentyTables connects diners with area eateries and food trucks by selling $6 tickets for lunch (one ticket) and dinner (two tickets). It’s a two-sided marketplace, targeting both the 52 percent of consumers who bring bagged lunch to work daily, and restaurants looking to reach new customers and garner repeat business. There’s no fee for restaurants to participate. As its name indicates, TwentyTables also donates five meals for every 20 meals sold through tickets to local nonprofit partners: Capital Area Food Bank, D.C. Central Kitchen and Martha’s Table. The TwentyTables footprint covers the District proper and surrounding areas like Arlington, Alexandria and Silver Spring — pockets with a focused supply of consumers and vendors. But “at scale, it won’t just be city propers, it will be extended suburban areas as well,” Cohen said. Following SXSW, where TwentyTables took home the "Best Bootstrap" prize at a startup pitch competition, the company is seeing vendors registering themselves for the platform, Cohen said — about a dozen so far. “That said, outside of that organic self-initiated growth, we have to be strategic with our focus and efforts, so right now we’re focusing on [the D.C. area] exclusively. In four to six months, we’ll start our initial outreach efforts to neighboring metropolitan areas.” The plan is to target young, socially minded cities with strong restaurant and food truck cultures, Cohen said. Baltimore, Philadelphia, Charlotte, North Carolina, Denver, Portland, Oregon, and Austin are on the list. Cohen founded TwentyTables in March 2017, followed by six months of research and development funded by an initial $300,000 raised. The company, bootstrapped since then, grew from five restaurants on the platform in January 2018 to more than 100 now, from homegrown soup company Soupergirl to D.C. craft beer bar Meridian Pint to the Peruvian Brothers food truck. TwentyTables makes a modest margin on ticket purchases, with other revenue streams to supplement ticket revenue, Cohen said, though he declined to share specifics or disclose annual revenue. The team comprises about 15 independent contractors. The model also includes a B2B program, in which companies can provide employees meals as a benefit. Cohen said he also sees a business opportunity in tourism, for families traveling to the region looking to eat affordably during their visit, and through local government, to distribute meal tickets to people in need. 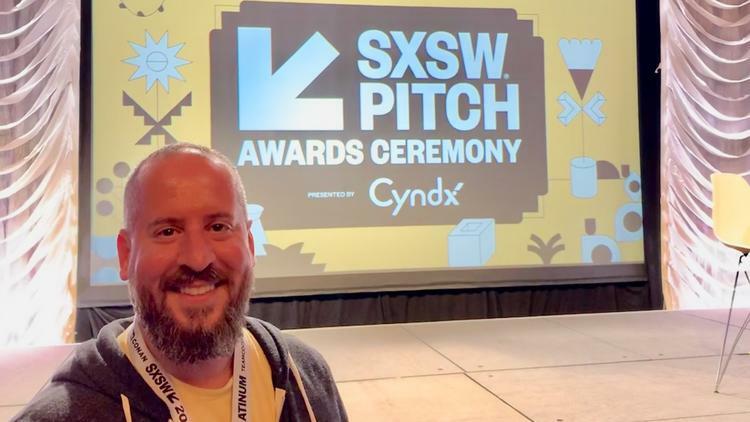 Alex Cohen, founder and CEO of TwentyTables, at the 2019 SXSW pitch competition in Austin, Texas.